All about tapas, by Enrique Becerra, Sevilla. Sevilla is the tapas capital of the world. This is where the tapas custom originated. Although I live only a couple hours away from that magical city, I don’t get there very often. It was thanks to Shawn that I acquired a copy of a book about tapas, with essays and recipes, from the owner of one of Sevilla’s long-established tapa bars, the eponymous Enrique Becerra. The book (in Spanish) is EL GRAN LIBRO DE LA TAPA Y EL TAPEO by Enrique Becerra (Almuzara, 2009). 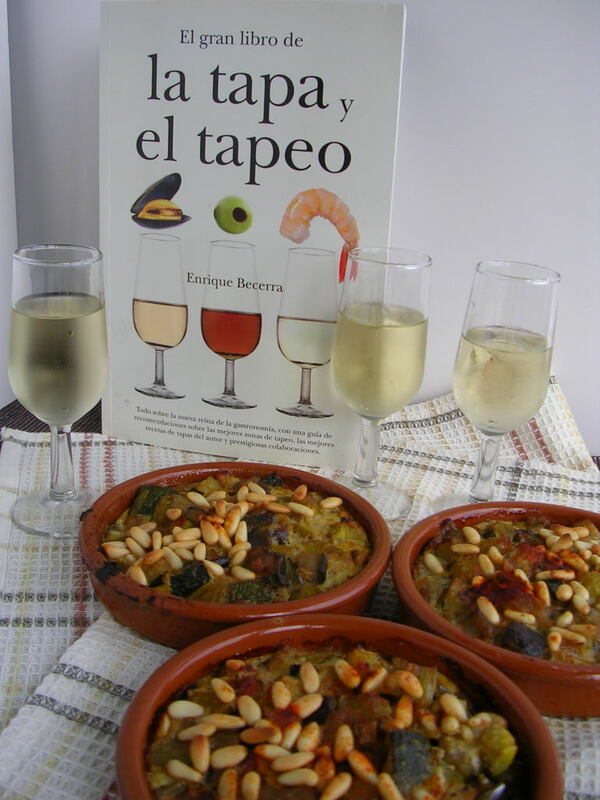 The book answers the question, “what is the tapa?” Answer: a small portion of something to eat that accompanies a glass of wine. And, yes, size matters. Not too big (you would need more wine), not too small (wine left over). Enrique Becerra relates how tapas originated (on Calle Sierpes); the meaning of the verb tapear—only conjugated in the plural, as in, “we’re going for tapas”—and the philosophical discussion of whether the tapas occasion can take place in a single bar or must move to several, and whether it can be enjoyed only standing up or whether it’s ok to sit at a table. The reply: it all depends. A few other observations from the book: tapas—to be tapas—are served one at a time and in individual plates. In other words, tapas are not meant for sharing. Although raciones might be . 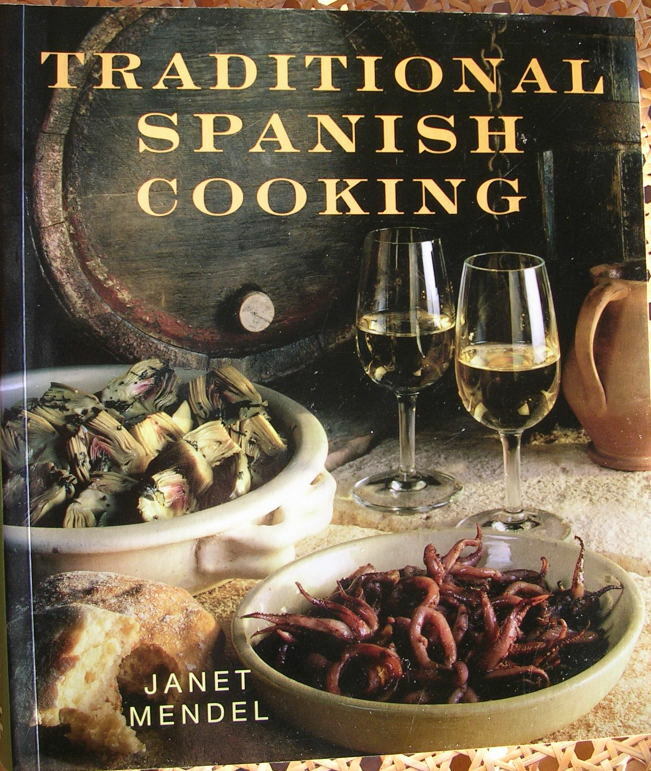 The recipes in the book are for very traditional Sevilla dishes—such as patatas con cazón en amarillo, potatoes and fish in yellow sauce; sangre encebollada, chicken blood stewed with onions and wine; remojón granadino, potato salad with salt cod and oranges—or reinterpretations of classics, such as shellfish sausage with fake baby eels in garlic or three-fish brochette with avocado sauce. 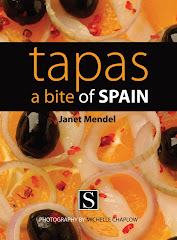 Book in hand, I’m off to the kitchen to prepare some Sevilla tapas in real time. 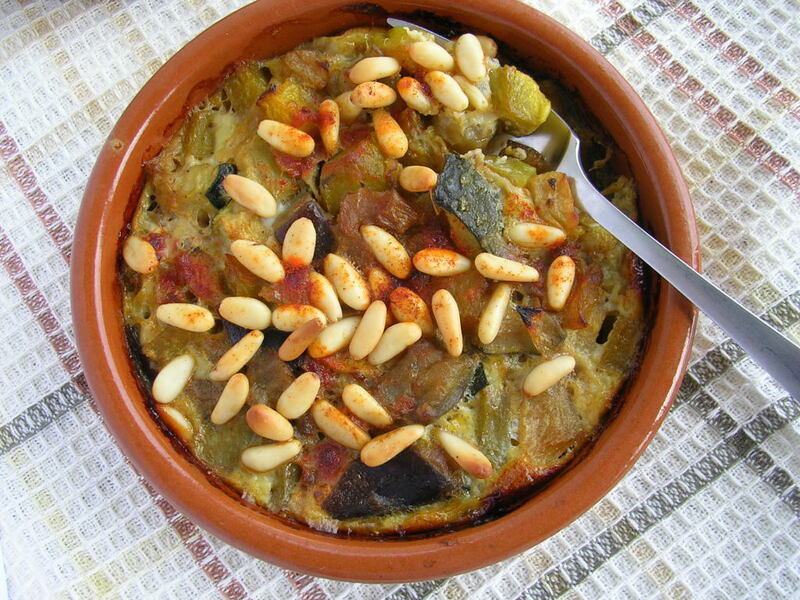 I chose a very traditional vegetable dish, alboronía, made with zucchini, eggplant and pumpkin with the unusual addition of apple, and a dead-simple, exceptionally tasty way to cook shrimp. 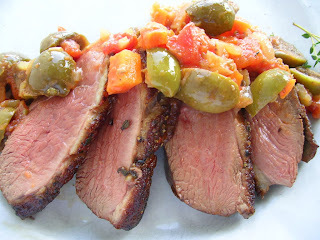 Adapted from the recipe in LA TAPA Y EL TAPEO by Enrique Becerro. 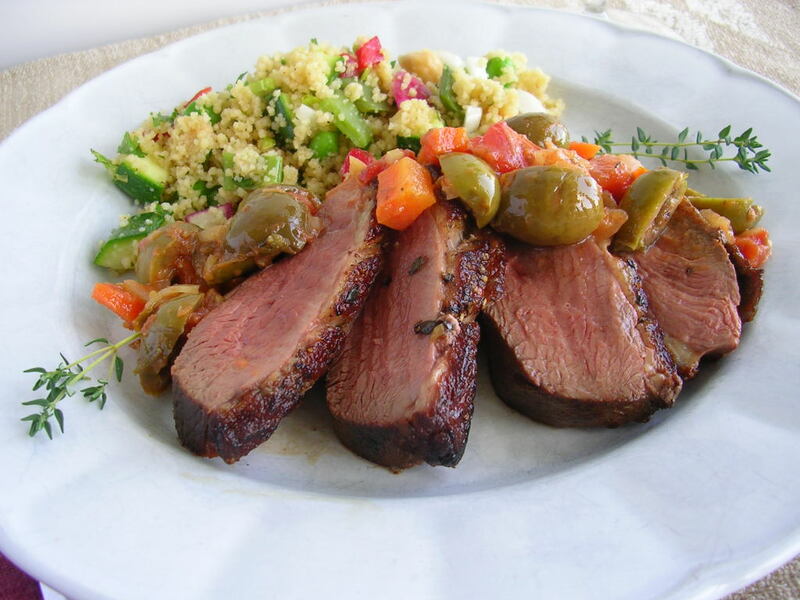 According to Enrique, the dish’s name derives from “Al Burán,” daughter of King Almutamid of Sevilla, the poet king, who, to celebrate his daughter’s wedding, commanded the best cooks in all of Islam. One of them created this delicacy for the occasion. Heat the oil in a heavy pan or earthenware cazuela. Sauté the onions and garlic until softened, 5 minutes. Add the eggplant and cook 3 minutes. Add the zucchini, pumpkin and apple. Season with salt and pepper. Cook on a low heat, stirring occasionally, until the vegetables are tender, about 15 minutes. The vegetables should release enough liquid, but, if they appear to be sticking, add a little hot water. Divide the vegetable mixture between four to six cazuelitas (small earthenware ramekins). Cover the tops of each with beaten egg and sprinkle over the pine nuts. Sprinkle with pimentón. Bake until egg is set and pine nuts are golden, about 25 minutes. Serve hot or room temperature. This recipe is adapted from LA TAPA Y EL TAPEO by Enrique Becerra. 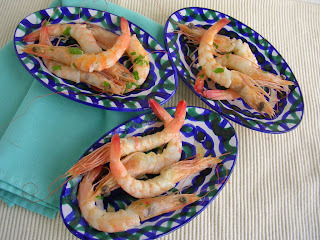 “Be sure to spoon up all the pan juices created by the wine and shrimp heads,” Enrique advises. This is best made with large shrimp with heads intact. That’s because the heads contain the roe that adds incredible flavor. Makes 6 tapas or 2 main dish servings. Peel the bodies of the shrimp, keeping heads and tails intact. Remove the dark vein. 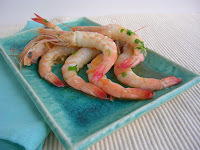 Spread the oil in a shallow oven pan big enough to hold the shrimp in a single layer. Lay the shrimp in the pan. Pour over the manzanilla. Sprinkle with salt, pepper and parsley. Bake for 4-5 minutes. 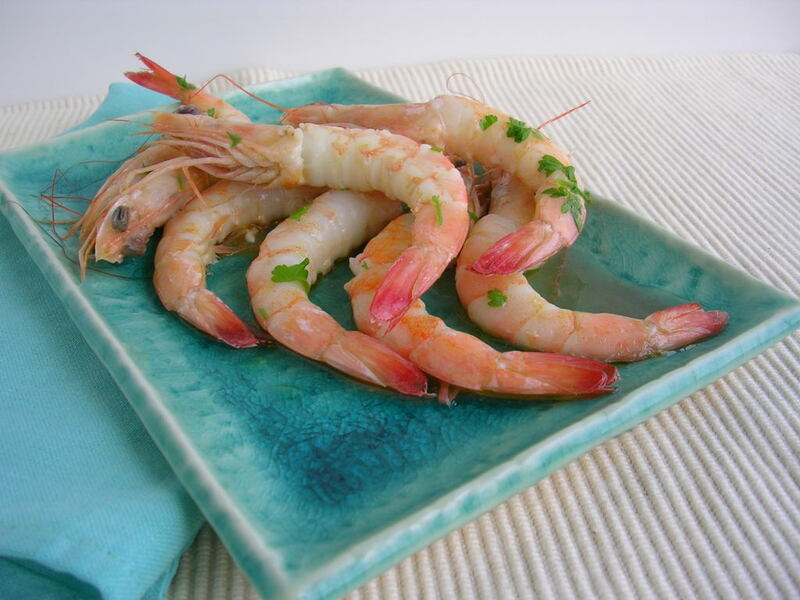 Serve immediately, spooning pan juices over the shrimp. ©Text, recipe adaptations and photos copyright Janet Mendel. I have a big bucketful of freshly-dug potatoes from my garden. 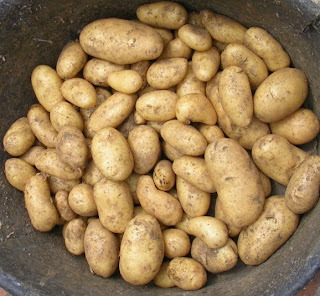 The spuds, brown-skinned and white-fleshed, come in all sizes, tiny ones, golf-ball sized ones, big lumpy fist-sized ones. Newly hatched, they still smell of the earth. I’ll be eating potatoes for quite a while. But, right now I need to celebrate their first appearance. I choose a simple recipe from the Canary Islands for papas arrugadas, wrinkly potatoes. The potatoes are boiled in heavily salted water until they are wrinkly and lightly coated in salt. Then they are served with mojo verde, a green chile sauce made with cilantro, fresh coriander leaves. 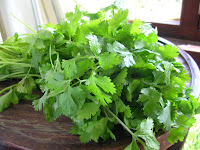 Fresh cilantro, a springtime herb. Cilantro, a spring herb like mint and parsley, is little used in Spanish cooking. Except for in the Canary Islands. The archipelago of seven volcanic islands is situated in the Atlantic ocean about 600 miles southwest of continental Europe, and only 65 miles off the coast of western Africa. Although the islands are Spanish provinces, they are closer to Morocco than to mainland Spain. And, in fact, mojo verde is very similar to the Moroccan charmoula sauce. Lots of cilantro, garlic, green chile and a smidge of cumin are blended with olive oil and vinegar to make the sauce that is tangy, hot, and fresh, all at the same time. To round out my menu, I added fish (fillets of dorada or gilthead bream) and the first runner beans from the garden. 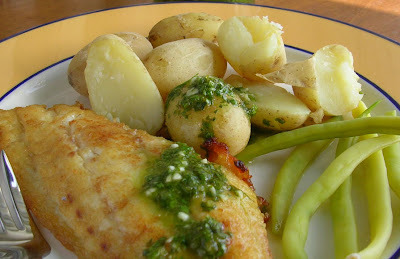 Wrinkly potatoes and fish with cilantro mojo sauce. 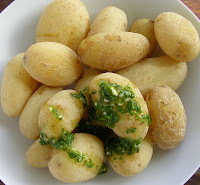 The potatoes and mojo can be served at room temperature. They make great tapas—just spear the potatoes on picks and serve the sauce alongside for dipping. Use small (1 ½ -2 inch) potatoes. Wash the potatoes but do not peel them. Place the potatoes in a pan with the salt and water. Bring to a boil and cook on a high heat until all the water has evaporated, about 20 minutes. The potatoes should be tender, coated with white salt and their skins slightly wrinkled. They can be reheated by adding a small quantity of water and allowing it to boil off. If using very small new potatoes, cook them in the water just until tender when probed with a skewer. Drain off the water and return the potatoes to the heat to dry them. Makes about ½ cup of sauce. Place all ingredients in a blender container and blend until smooth. Sauce keeps one week, refrigerated. Serve at room temperature. Speaking of cookbooks, let me tell you about mine. As you can see from the lineup in the left-hand column, I have five cookbook titles currently in print. 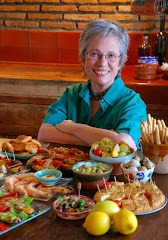 All are about the food of Spain, with recipes, anecdotes and information. Although there is some overlapping—recipes for potato tortilla appear in all five; gazpacho in four and recipes for paella in three of them—they are each quite distinctive. 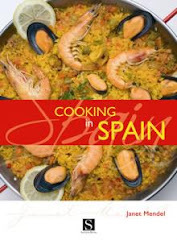 COOKING IN SPAIN (Santana Books, Spain; 2006). Where it all started. My first cookbook (pictured at left) was published in 1987 by Lookout Publications in Spain. The book and recipes grew out of a monthly cooking column that I wrote for Lookout, an English-language magazine published in Spain. (I wrote food and other features for 30 years, until the magazine eventually folded.) The new edition of COOKING IN SPAIN was published in 2006 by Santana Books in Spain. I wrote the book specifically for expats like myself, who needed to find their way around Spanish markets—what is that weird fruit? how do you cook that kind of fish? what are all these cheeses? sausages?—and, having tasted Spanish food in restaurants and tapa bars, wanted to try some of the dishes in their own kitchens. 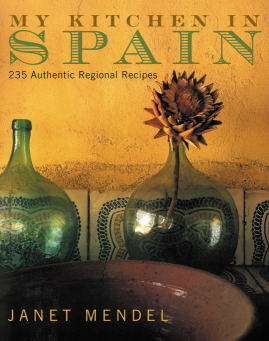 A Spanish-English glossary of ingredients, cook’s tour of regional cuisines, shopping tips and more than 400 recipes made this the “bible” of Spanish cooking. Because this book was written for people who shop and cook in Spain, recipe ingredients in COOKING IN SPAIN are given in metrics; dry ingredients such as flour and sugar are measured by weight, not volume. Although I provide conversion charts in the book, I think it’s easier to just buy a scales (up to 5-kilo) and a 1-liter measuring cup. 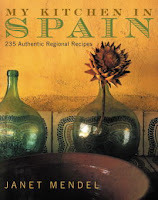 MY KITCHEN IN SPAIN—225 Authentic Regional Recipes (HarperCollins, USA; 2002). This is my most personal cookbook, with stories of how I learned Spanish cooking in village kitchens and tapa bars. I tell you about a visit to a ranch where fighting bulls are raised (in the company of one of Spain’s first female bullfighters); about baking country bread in a wood-fired oven; about gazpacho made right in the fields; close encounters with tentacled creatures; María’s Christmas turkey, and much more. There’s a whole chapter on paella and other rice dishes and seven variations on the gazpacho theme. Vegetables and salads get big play in this book. 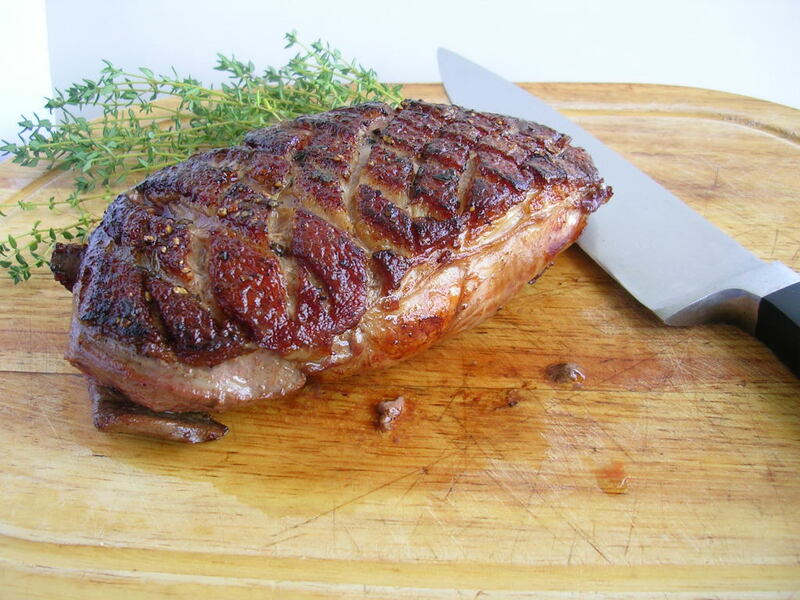 Pork rules the roost in the meat chapter (no beef recipes other than bull’s tail and bull’s testicles). 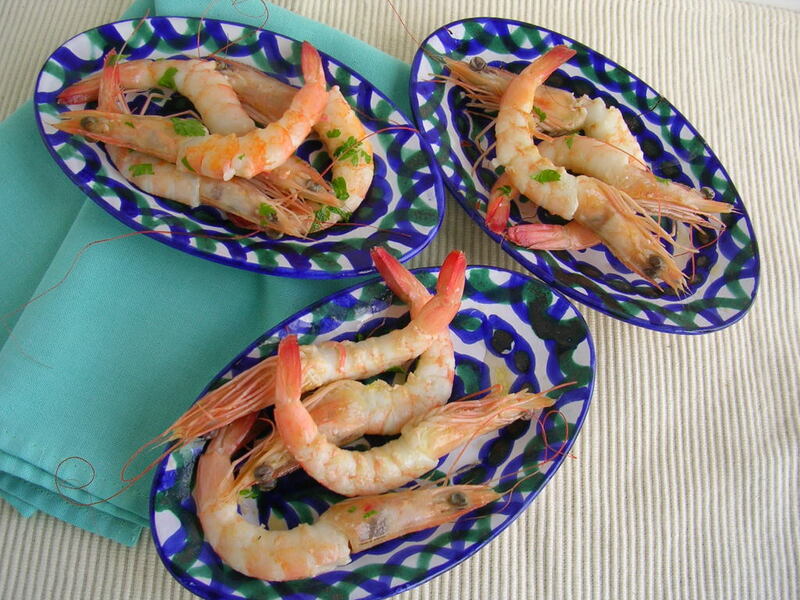 The seafood chapter has the most recipes—39—reflecting the importance of fish and shellfish in Spanish cuisine. I surprised myself with the dessert chapter, which comes in second with 36 recipes for cakes, pastries, puddings, confections and fried sweets. And, you thought there was nothing more than flan! 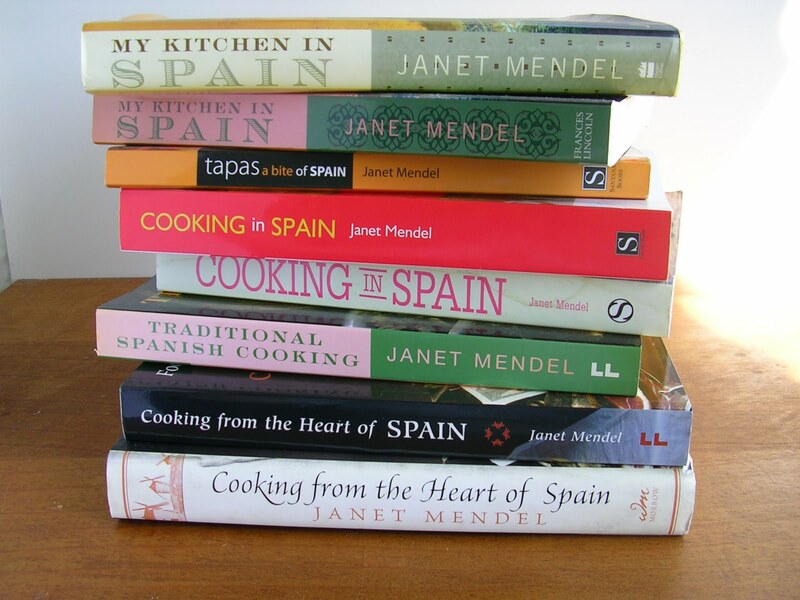 MY KITCHEN IN SPAIN was a top-ten cookbook pick in 2002 by Food & Wine magazine, New York Times, and Pittsburgh Post-Gazette. 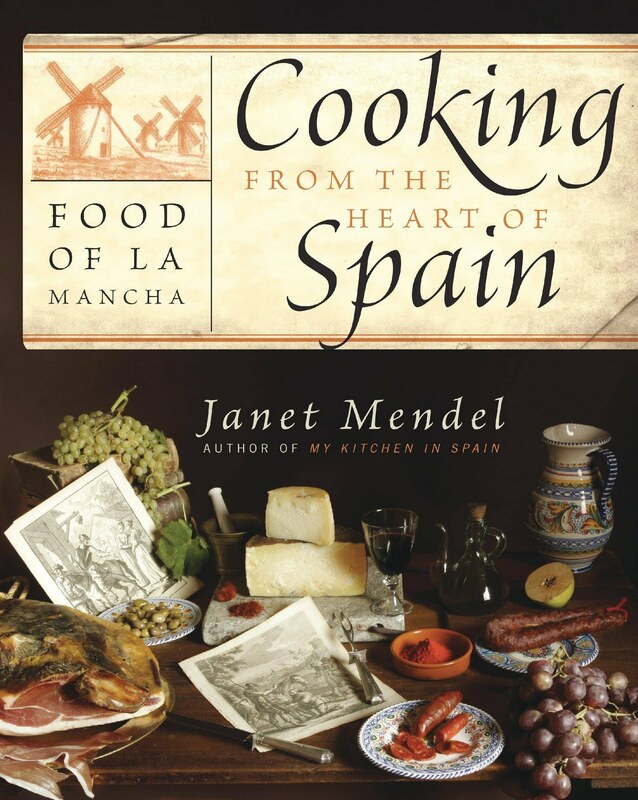 COOKING FROM THE HEART OF SPAIN—Food of La Mancha (WilliamMorrow, USA; 2006; and Frances Lincoln, UK; 2008). I loved writing this book, which was inspired by Cervantes’s book, Don Quixote de La Mancha. For a cookery writer, Cervantes provides fantastic leads. The very first paragraph of the novel describes the character of Don Quixote by telling what he had for dinner every day of the week. The story of Camacho’s wedding feast provides more food tales. And Sancho Panza continually grouses about his victuals. I spent time in this region—the heart of Spain—exploring, tasting, talking to people who produce food, sell it, cook it and eat it. I interviewed a maker of Manchego cheese, a marqués who produces fine wine, a knife-maker, a woman selling her produce at a farmer’s market, a top chef. I harvested saffron, caught trout, and went on a partridge hunt. I weave these stories in with the recipes. Surprisingly, here’s a Spanish cookbook with no paella recipe, no gazpacho. Instead are several saffron-flavored rice dishes made in cazuela and gazpachos, plural, a hearty shepherd’s stew with poultry in place of cold tomato soup. 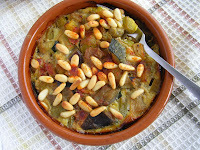 I’ve included lots of great soups, including the terrific Castilian garlic soup, and flavor-packed stews with legumes. Recipes for fresh trout and for salt cod fill out the fish chapter (although this inland region does have fresh seafood). Beef, pork, kid, lamb and game dishes from this region are noteworthy. As in MY KITCHEN IN SPAIN, there are recipes for fabulous desserts and sweets. COOKING FROM THE HEART OF SPAIN was a top ten cookbook pick in 2006 by the Chicago Tribune. TRADITIONAL SPANISH COOKING (Frances Lincoln, UK; 2006). The British edition of this book, first published in 1996, is distributed in the US. 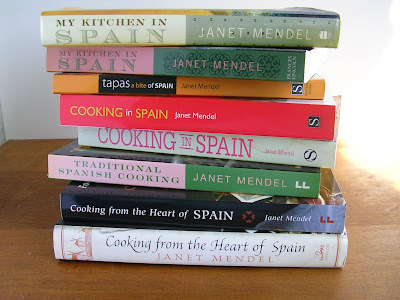 TRADITIONAL SPANISH COOKING won the prestigious André Simon cookbook award in 1997. In 2010 it was named 25th of 100 all-time best cookbooks by The Observer, right up there with Julia Child and Nigella Lawson (see the list here ). 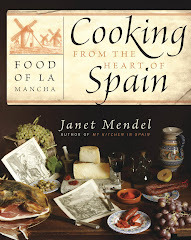 In this book, I put traditional cooking in historical context—Altamira’s cave paintings as menu on the wall; the Romans who came to conquer and stayed for lunch; the kingdoms of Al-Andalus where people supped in flower-scented courtyards where fountains bubbled and musicians played; before Columbus, when King Ferdinand and Queen Isabella sat down to dinner, there was not a potato or tomato in sight. No chocolate. Imagine. 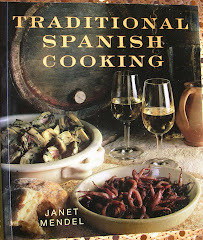 Sprinkled with Spanish proverbs about food (la olla y la mujer, reposadas han de ser—woman and stew need to settle), the book has recipes for many typical dishes from home cooking, seldom found on restaurant menus. Eel braised with garlic; cuttlefish with peas; rabbit with home-made noodles; “poor folks” potatoes and stuffed eggplant. I’ve included some very unusual recipes, such as piñonata, a dense, pine-nut honey cake once served as a wedding cake in some Andalusian villages. It requires making noodles with ground nuts, frying them and mixing with boiled honey, spices and pine nuts before packing into molds. I later discovered a very similar recipe in a Sephardic cookbook. TAPAS—A BITE OF SPAIN (Santana Books, Spain; 2008). Loving those tapas in Spanish bars is one thing. But, how do you get the tapas from tasca to your table? This is both a cookbook and a guidebook. It starts with a tasting guide to tapas round Spain—how to enjoy them and what to eat. 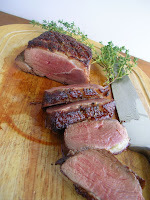 Then I show you how to translate those great dishes to your own kitchen. The recipes are arranged by the way tapas are prepared and served—spread on toast, stuck on a cocktail stick, in a cold salad, hot off the griddle, in a cooked dish with sauce. 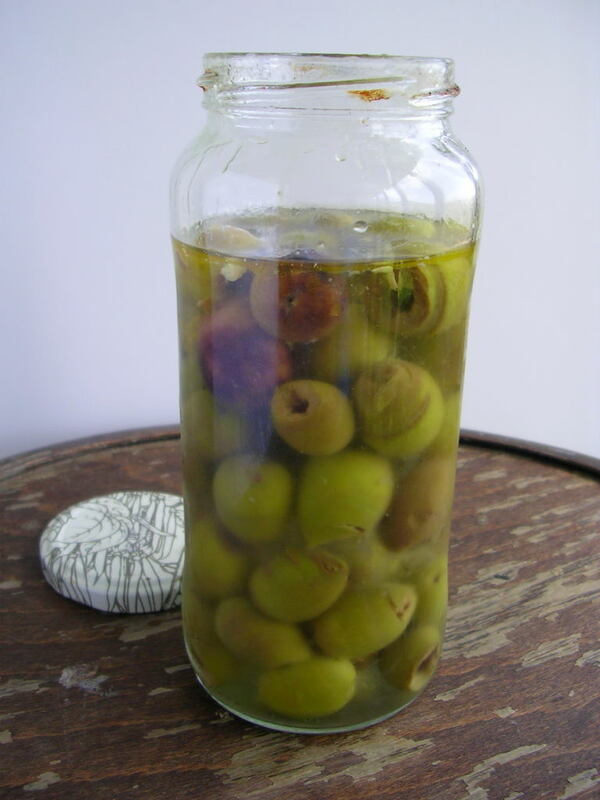 Many tapas can be turned into starters or main dishes by increasing the serving size and adding accompaniments. I give you menu ideas in the chapter Planning a Tapas Party. 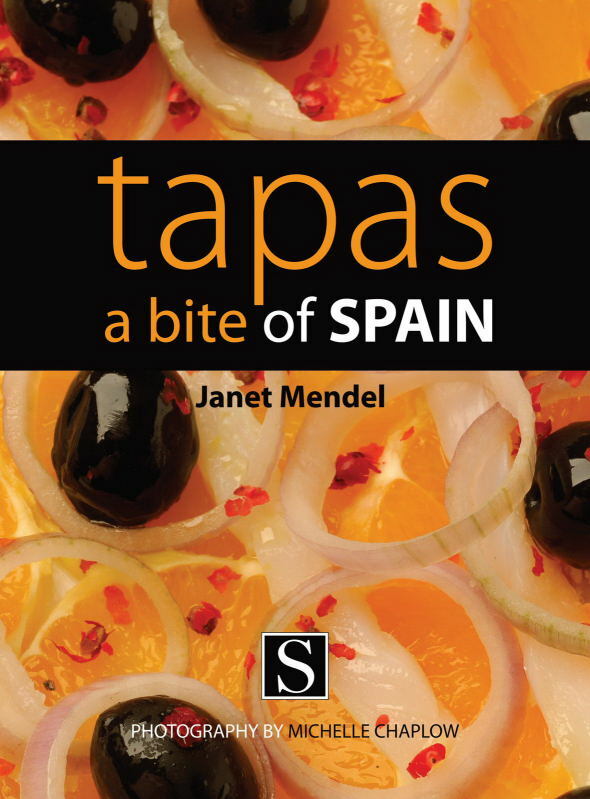 The book includes guides to Spanish ham, cheeses, olives, olive oil and wines; a handy Spanish-English glossary, and 140 recipes for favorite tapa dishes. Measurements for ingredients are given in three standards, metric, British and American. Photos are by Michelle Chaplow. Recipes in all of these books have been tested by me in my home kitchen. You can order any of the books by clicking on the cover pictures at left. Want to know more about the books? Just leave me your questions in COMMENTS below.